Pricilla: You’ve got funny lookin’ eyes. Rango: Well you’ve got a funny lookin’ face! Pricilla: …You’re a stranger. Strangers don’t last long here. 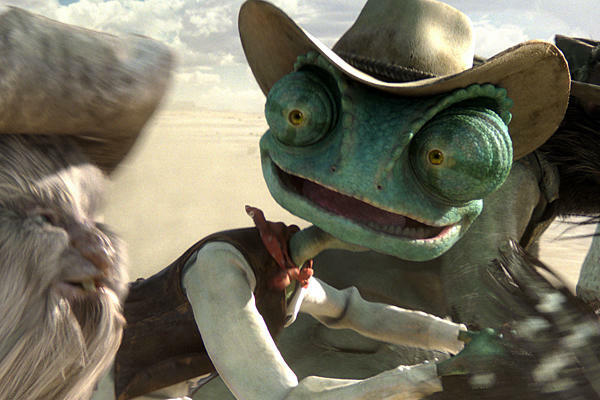 I’m gonna start off big with this one partner – Rango is the best film I have seen so far this year. I absolutely loved watching this movie. It is incredibly well crafted, scored, gorgeous to watch, funny, and handled greatly in its action. It is also quite weird, in a good way. 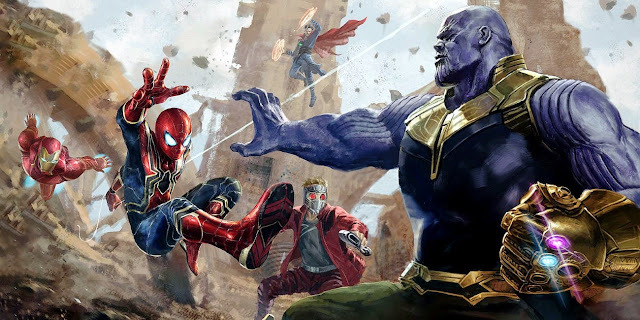 For a major studio release, which will mostly be seen by kids, there is a lot of satirical and weird humor layered throughout this film, yet it all works so well. Rango is a fantastic western adventure comedy that will hopefully be enjoyed by many. Johnny Depp stars as the voice of Rango, a chameleon lizard who has accidently found himself stuck in the middle of the Mojave Desert. 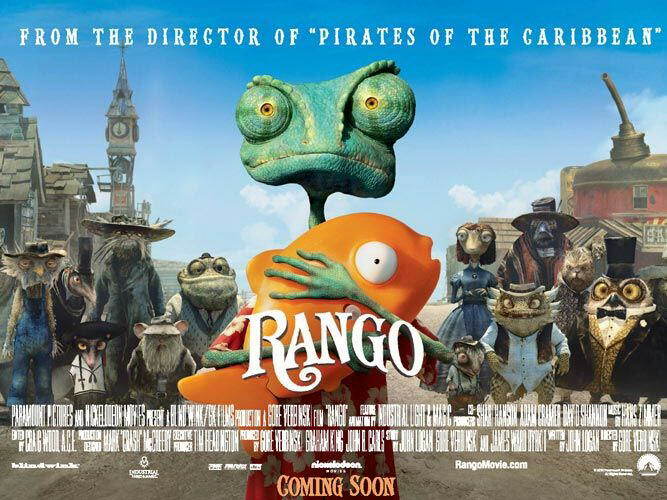 Rango eventually winds up in an Old West town, known as Dirt, populated by other critters, all styled around the various types one would find in a Western. 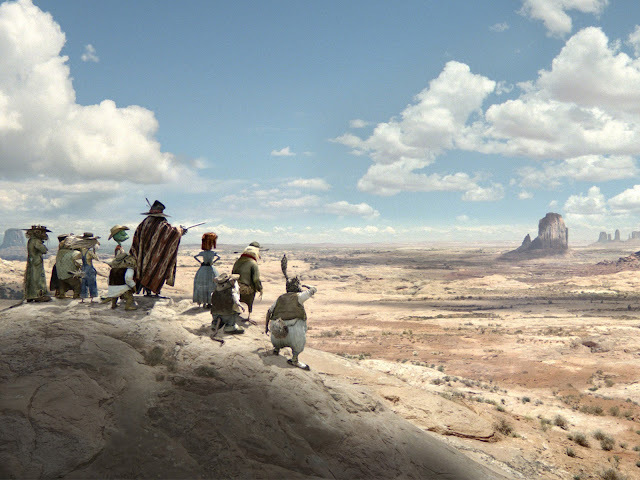 Soon, Rango manages to accidently kill a hawk that has been terrorizing the town. As the citizens believe to have witnessed a heroic act, Rango is quickly established as the new sheriff. Two main obstacles now cross the path of Sheriff Rango; he must help the town of Dirt by unfolding the mystery behind the town’s water crisis. He must also prove the heroic identity he has established not only to his doubters, but to himself. I love the fact that a film like this was able to be made. It has a premise that is very much rooted in the world of the Western: a new sheriff’s in town, he must tend to the town’s corruption, and his heroism will be tested. Yet the film has so much fun acknowledging the genre in many ways, while also establishing an original identity of its own. Rango was made by filmmakers who know Westerns and movies in general very well, and don’t have to rely on obvious pop culture gags (beyond a few key moments). Merrimack: What do we do now sheriff? There are so many great things about this movie, but I want to go back to the weirdness. There is a dream sequence early in the film that has imagery evoking surreal artistry. It is the kind of scene that looks very interesting, while also still being quite funny in a way. The whole film follows this logic. The characters all speak with a twang in their accents and have clothing that evokes a particular time period. Why would they speak this way and how have these clothes been made? It doesn’t matter, the movie has created this wonderful world, and we have to roll with it. Similar to a movie like Fantastic Mr. Fox, there is a very particular style to this movie, and it is completely embraced for the better. Another aspect this film has in common with ‘Fox’ is how the actors were recorded. Minimal sets and costumes were given to the actors, who were able to record together and work as if in a mini Wild West stage play of sorts. As a result, the voice acting in the film feels more natural and energetic. Along with Depp, other actors include Isla Fisher, Bill Nighy, Abigail Breslin, Alfred Molina, Ned Beatty, Ray Winstone, Stephen Root, Harry Dean Stanton, and Timothy Olyphant. This is the kind of cast that assures me that more was put into getting who is right for these roles, as opposed to finding the biggest A-list cast possible. Johnny Depp’s work, in particular, was a lot of fun. His character, Rango, is the perfect type of flawed but likeable character who creates many facets of his personality. There is a nervous quality to him, but he also has the ability to shrug off certain fears in favor of having fun. Rango establishes himself early on as an actor of sorts. He loves the idea of putting on a show for others and clinging onto the character that he creates. This both hurts and helps him, and it is the way Depp conveys this aspect, through voice acting, that the character is fully realized. 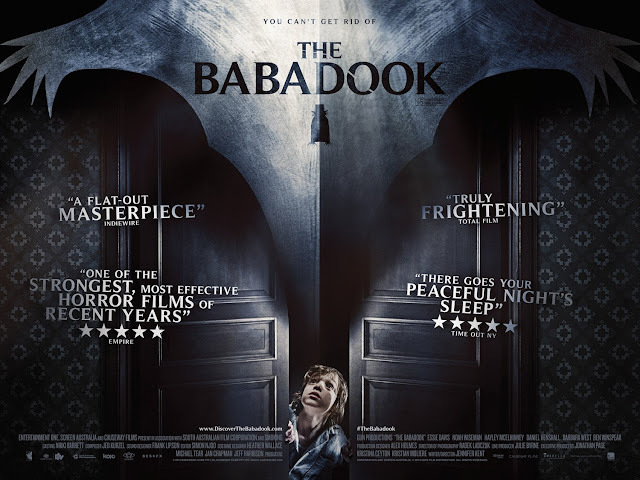 The film was directed by Gore Verbinski, who is known mainly for having directed the Pirates of the Carribean trilogy, but has been quite versatile in his film choices throughout his career (The Ring, The Weather Man). Now, he has stepped away from live action in favor of directing an animated feature. Being familiar with Verbinski’s filmography, it is interesting to be able to pick up on how he has done things similarly here, as he has in live action films. Suffice it to say, the assembly of this film is very well handled, but there are also many others to credit as well. 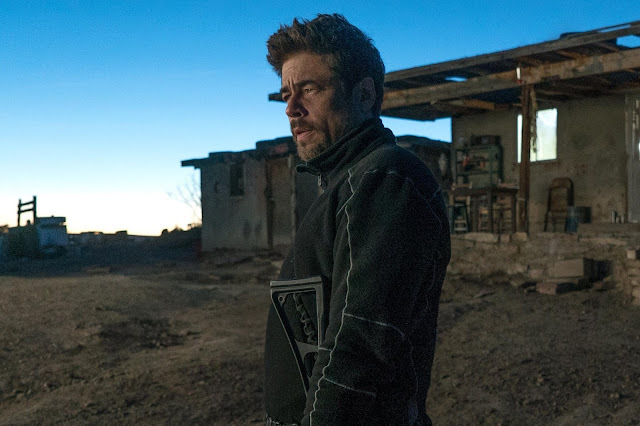 Cinematographer Roger Deakins, a frequent collaborator with the Coen Brothers (he was nominated for his work on True Grit) and famed director of photography all around, served as a creative consultant for this film. This was a great choice to have made, as the film is benefited so much by how beautifully crafted some of the shots of this film are. It is not enough that the animation is great (which I’ll get to), but the film, once again, gets across the notion of being a strongly rooted Western so much more by having wide shots of vast terrain, tight close-ups on characters eyes, and a number of beautiful scenes involving the sunlight, among other Western staples. This was an aspect I was actually very excited to see in this film, and it paid off greatly. The animation for the film was created by Industrial Light & Magic (ILM), generally a very highly regarded special effects company. Given that this is the ILM’s first feature animated film, I can only imagine great things for their future films done in this manner, as this Rango looks fantastic throughout. The character designs are purposely exaggerated to an extent, but are all wonderfully designed and great to look at. Given that this is a film set in a desert, filled with animals covered in scales and fur, there is plenty to do animation-wise. 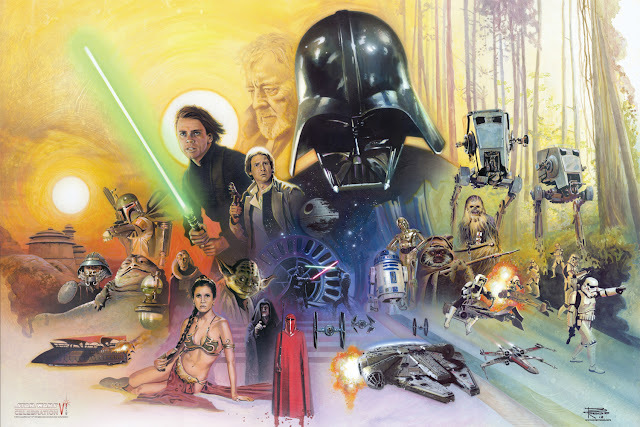 ILM was able to pull this all off significantly, with so much great detail out there to see. Hans Zimmer has provided the score for the film, and it is an appropriate Western sound. Adding to Zimmer’s work is a mariachi band in the form of owls, who serve as a sort of Greek chorus for the film. And then Los Lobos comes in to provide the Rango theme song. The works of many talented people have gone to great lengths to make this film have a fun soundtrack to listen to. 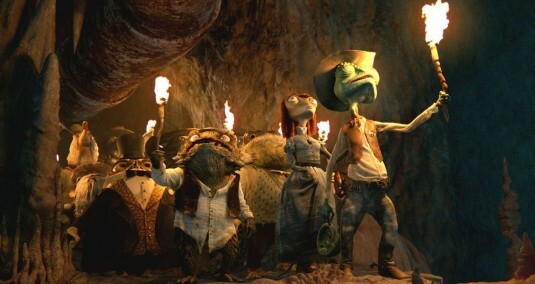 As much as I simply admire the craft in this film, it is also good to know that Rango is a whole lot of fun to watch. It is frequently funny, whether the jokes are more tailored to a kid or adult crowd, the humor is balanced very well for all to enjoy. It is also full of some great action. 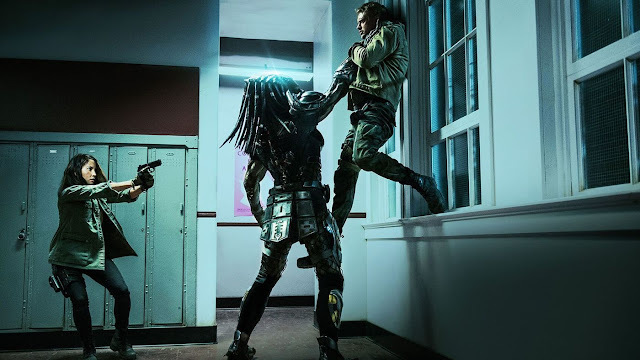 A chase scene that highlights the middle of the film may be one of the best action sequences I have seen in quite some time, as everything is captured in just the right way, never confusing the audience as to the positioning of characters and location, while also being downright exciting to watch. The film does delve into its PG rating, due to some of the basic weirdness and the fact that there is peril and death for some characters during this Western journey, but it is never too much. Finally, this film is only in 2D and that is very much a plus for me (enjoy seeing the clearly lit colors and textures). Last year, How to Train Your Dragon was released, and met with very high regard from many. While I liked that film quite a bit, I was not nearly as taken by it as a lot of others were. 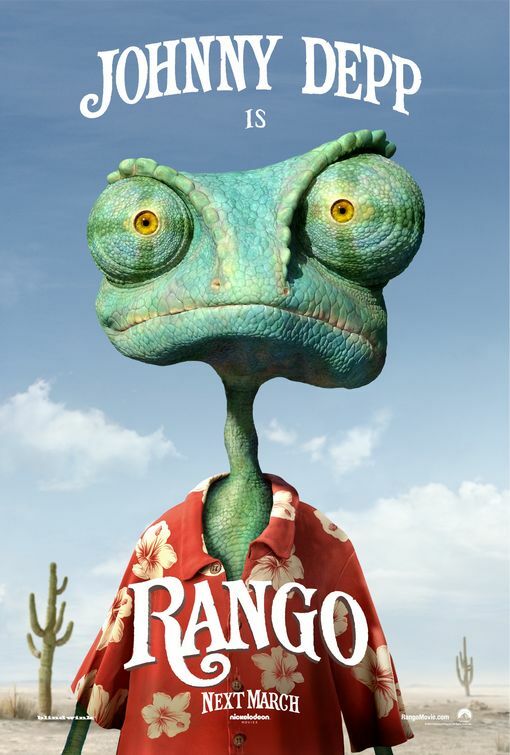 Rango is for me what ‘Dragon’ was to those many others. While I can only hope that it is met with similar success, I can still revel in the joy that I had watching this movie and that I will continue to have when I revisit it. Stunningly animated, frequently funny, and wonderfully well crafted; Rango has all of the qualities of a film that I would love to support. Go and catch a screening, whether it be at dusk or high noon. Beans: So who are you really? Rango: Well I’m a man of many epithets. There’s my stage name, my pen name, my avatar; I’m actually one of the few men with a maiden name.